The turn-out for the show this year was disappointing at best with the crowd staying away in droves even though the weather was great. That said, the woodwork section still attracted plenty of interest and a couple of new members to the club so we're not complaining. At least the people that did turn up were a discerning bunch who helped break our record for raffle ticket sales yet again!!! 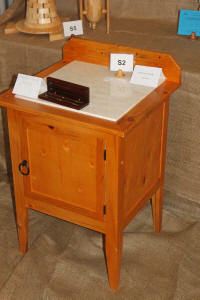 This year the club made this desk from Sally Wattle we milled ourselves which was won by a chap from the Gemfields. 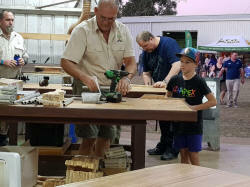 This years club challenge timber was a 600mm length of Sally wattle slab and 1200mm length of random 75x75mm eucalypt (example in bottom right of picture). As you can see, chairs were an obvious choice for a project! Clarrie won the day with his segmented platter (centre). 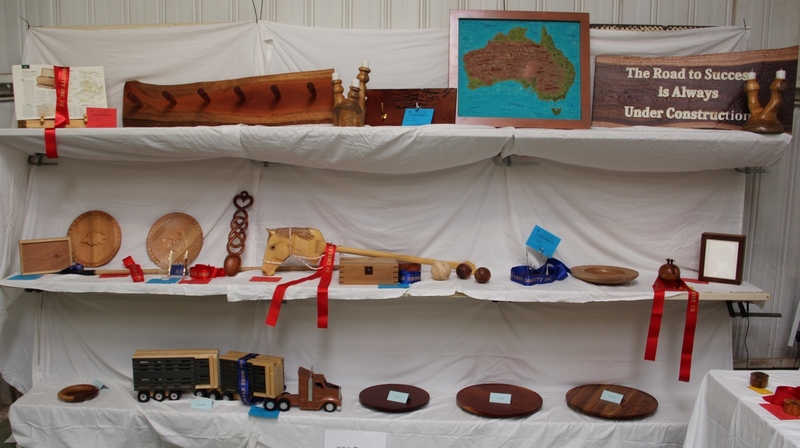 A wide range of entries was seen in the general woodworking competition. 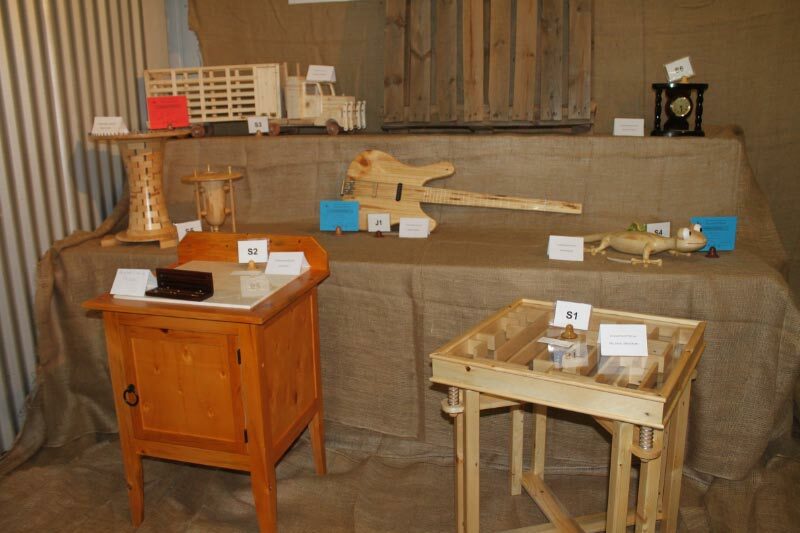 A few furniture pieces made their way into the display but the smallest of items took out the champion prize - a collection of business-card pocket boxes. 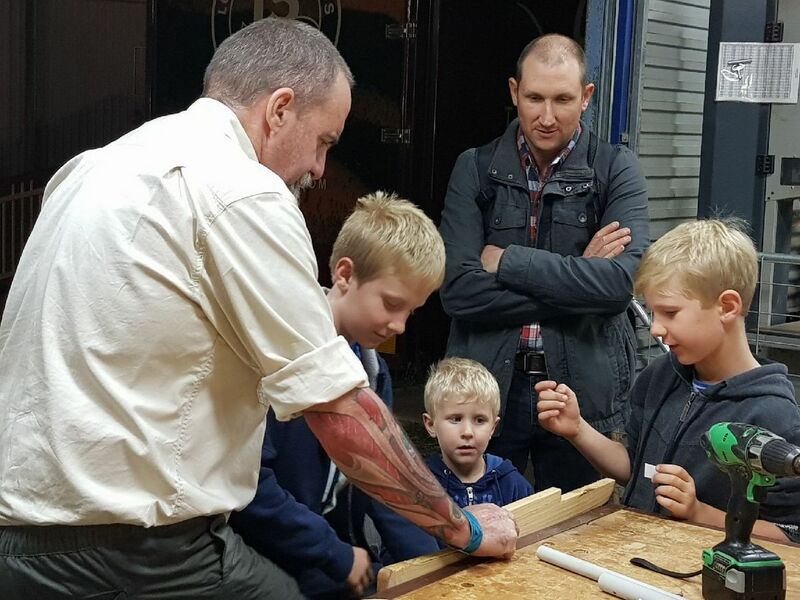 The new kids projects made their debut this year and proved very popular with lots of pirate swords and fairy wands getting waved around at siblings. . . but the rifles are still the number one choice for at least half the kids! The girls had a ball decorating their fairy wands . . . another delighted customer!
. . . and the same one as every other year as well! 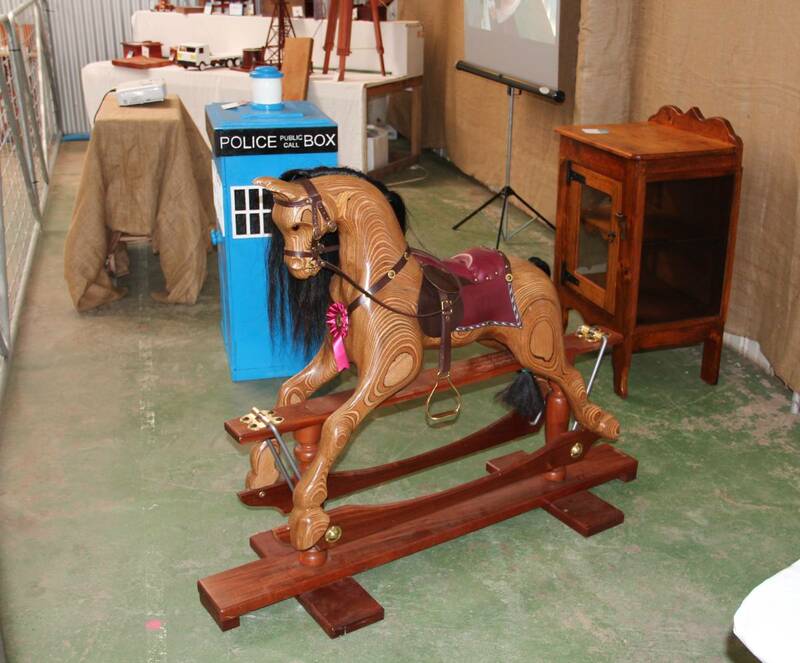 The weather for this years show was just about perfect and even though the crowd was late building up, we still managed to break our own records for both raffle ticket sales and toy sales. Gotta be happy with that! 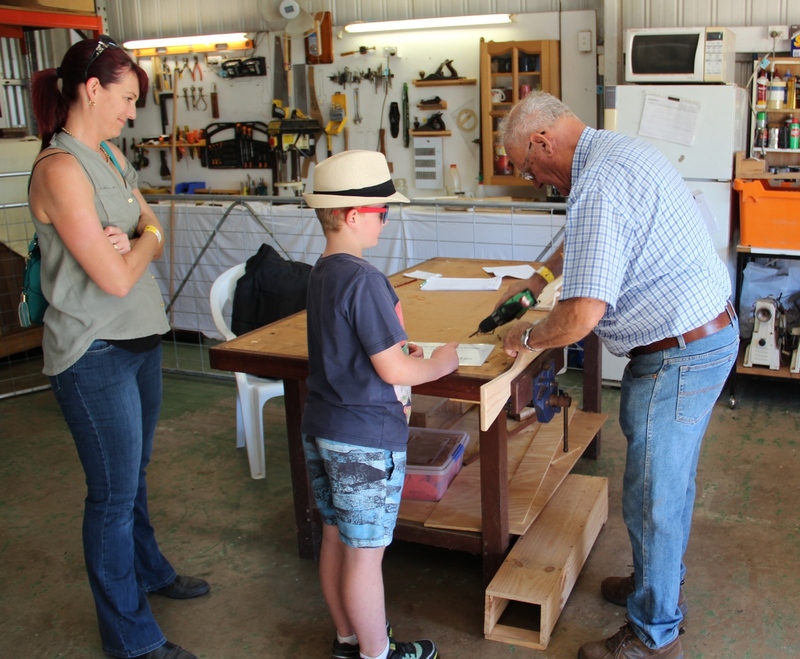 The clubs raffle prize this year was a dining table made from Lemon-scented Gum that the club harvested and milled themselves. 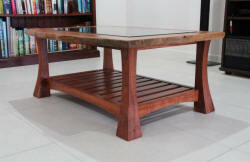 The design includes a pole 'stretcher' that came from an old stable which is possibly Ironbark. Hardly a soul walked past without feeling the urge to touch the table and once they had done that, the tickets just sold themselves. 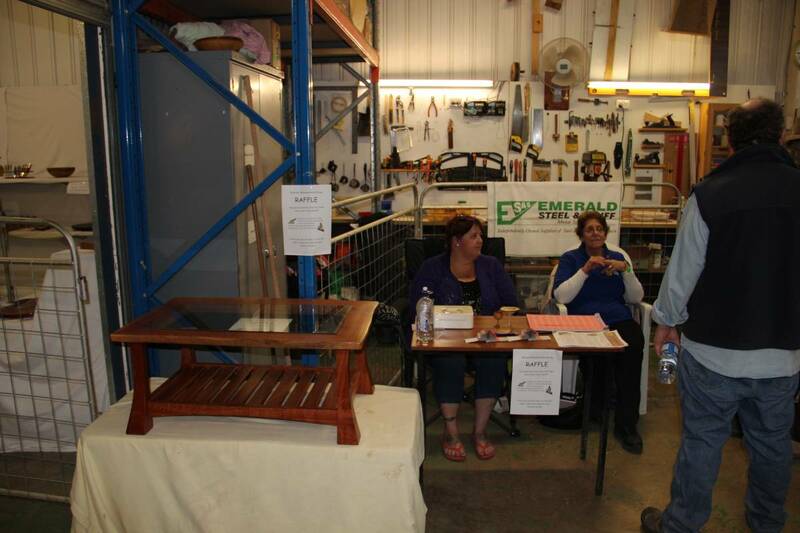 The table was won by a very happy Diane O'Brien from Emerald. The only toy kits we had this year was rifles and we somehow had just the right amount of kits prepared, only running out just as everyone was packing up! 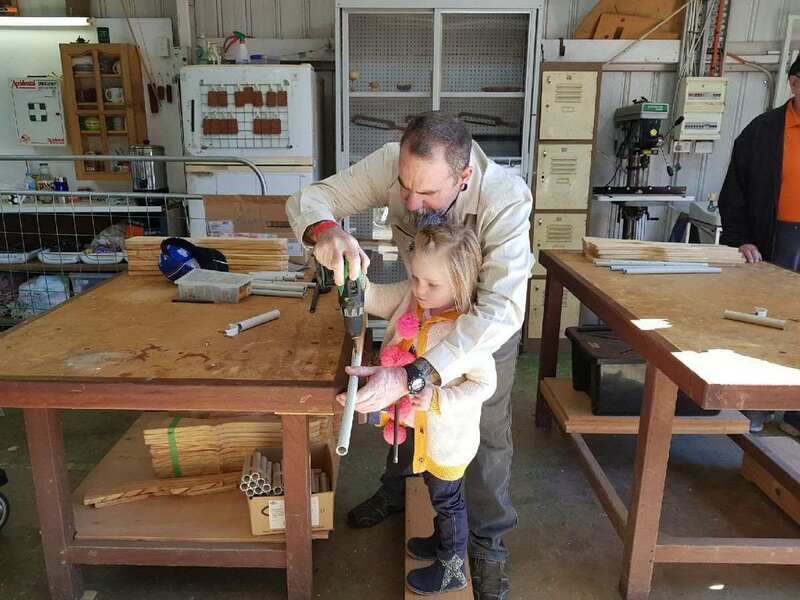 One of our new members came up with an idea for another kit for next years show which should make a nice change for the kids who already have several of our rifles! 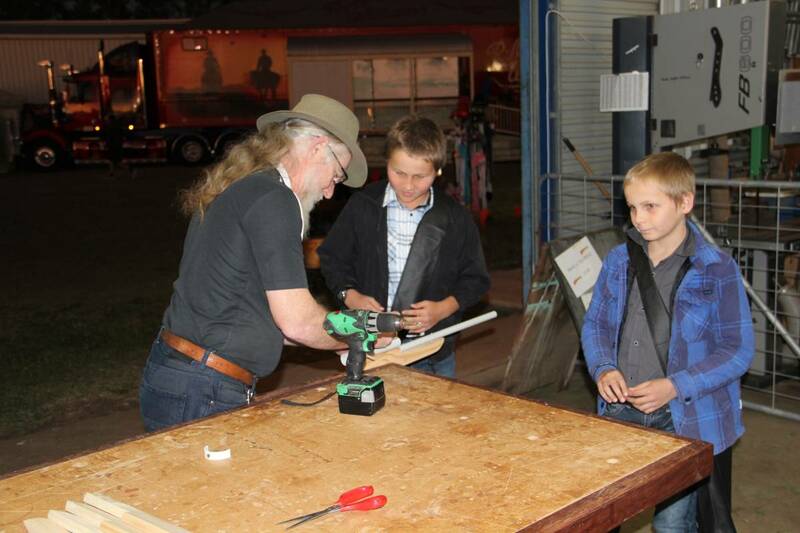 - Pirate swords that the kids can put together themselves! Come along in 2018 and check them out! Our club challenge this year was to make what ever we wanted from a natural edged slab of Sally Wattle about 900mm long and 300mm wide. 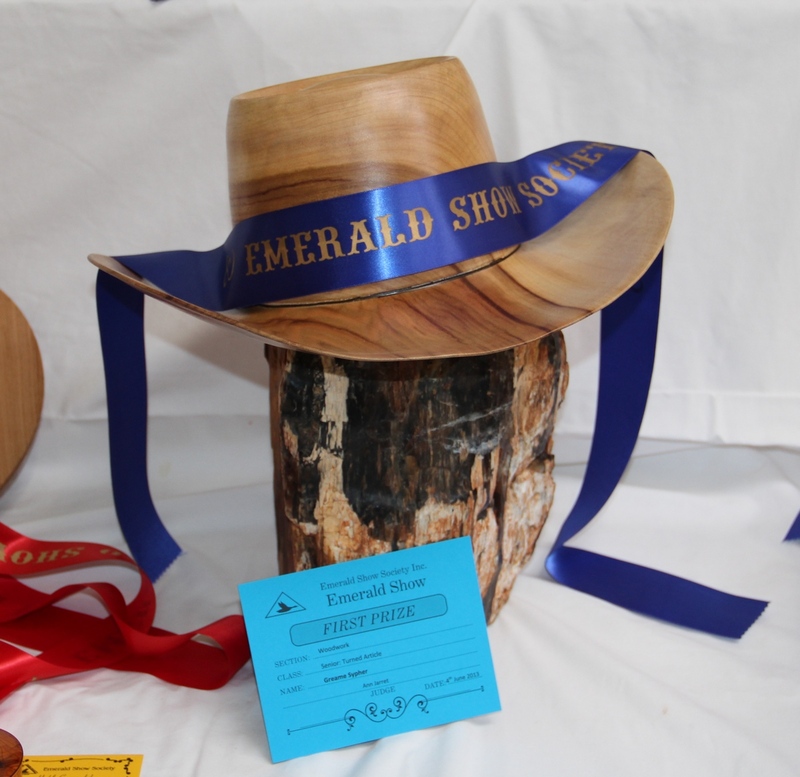 We left the handing out of the timber far too late this year which limited the number of entries dramatically but still made a fair display. The People's Choice award this year went to Ray's 'Turtle' step which he whipped up on the Sunday before the show - cutting it fine indeed! Though we didn't break any records for entry numbers in the general competition, the variety of the entries was excellent. Everything from the usual vases and boxes . . . .
. . . to a hammer-mill simulation and some cattle yards! We had lots of junior entries this year which was great to see. 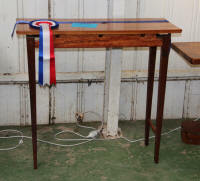 The Woodworking overall champion prize this year went to one of Jeff's segmented forms. . . . . again!!! With Emerald's economy still very much in the doldrums, there were fears the show wouldn't see much of a turnout but all things considered, the club still did quite well. A big change in our displays this year following the expansion into another third or so of the pavilion. The four solid hardwood workbenches the guys made during the year doubled as display stands and hessian backdrops hiding the junk in our shelving worked out much better than previous years. Plenty of entries and variety in the competition this year, aided greatly by a very productive new member. Everything from a CNC'd grandmother clock to a replica stationary engine with a foot-switch so the kids could have a go at making it run - it even sounded like the real thing! 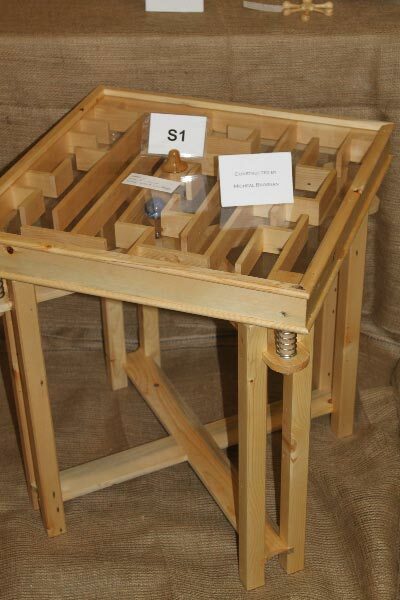 Our Club challenge this year was a very real challenge - each entrant was given two 1"x1" and a 2"x1" Northern Silky Oak 'garden stake' plus another 1"x1" random species - all very well weathered while sitting for some years at a disused sawmill up North. All things considered, the standard of entries was excellent and I think the guys enjoyed trying to make the most of such 'ordinary' materials! One day every kid in Emerald is going to have so many toy rifles stashed at home that we aren't going to be able to sell any more . . . but still they come! The clubs raffle prize understandably gained a lot of attention this year - a very solidly built kitchen bench/butchers block featuring dovetailed joints on the frame and an 'Illusion' end-grain cutting board recessed into the Beefwood top to pick up the spills. 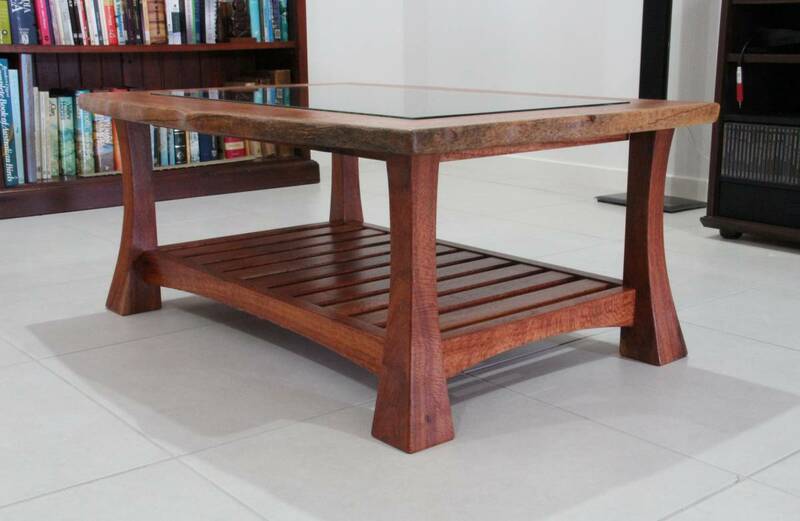 A very nice bit of furniture which was won by an employee of the local hardware store that supports the club so well - a very happy ending for all! 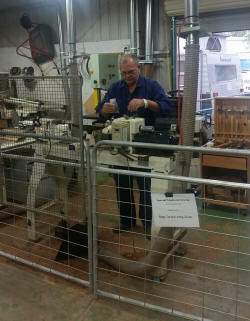 And there's that bloke at the lathe again! Making cute little mice this year which proved popular. 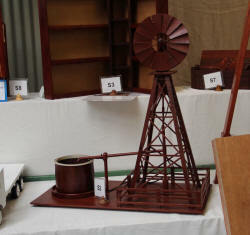 The 2015 show got off to a very slow start but finished quite well for the club considering the effect the mining slump is having on the town. Emeralds economy might be sliding but club membership has taken off so well we've had to expand our workshop to fit us all in. 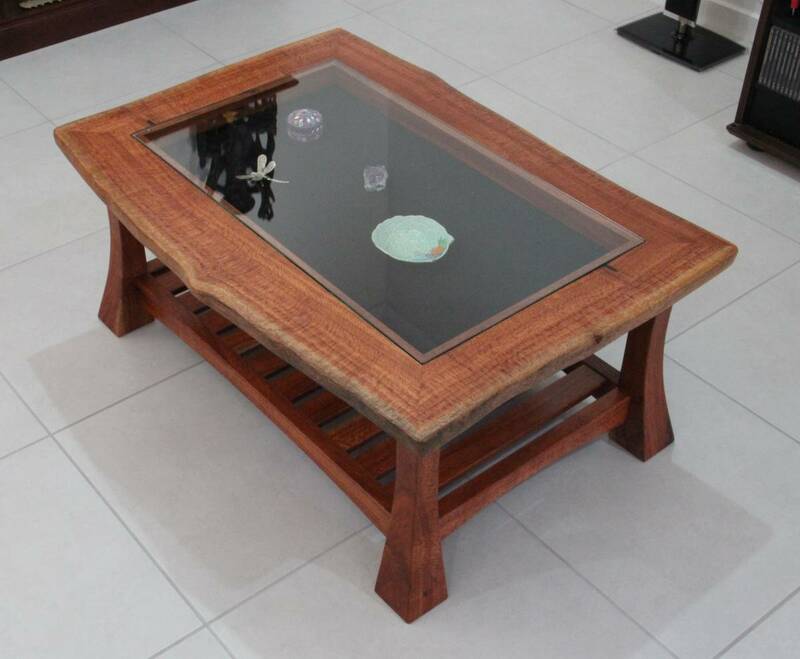 The lads designed and built this collectors coffee table for this years raffle prize from Silver Oak they felled and milled themselves. Ticket sales didn't break any records but were still good considering the number of visitors . . . . and the winner wasn't a club members relative for once!!! This years challenge was to make something from a piece of Bloodwood or Bluegum, 200x50x1000mm long or 100x100x1000mm long. The standard was good and some of the new members dived right into the competition as well. 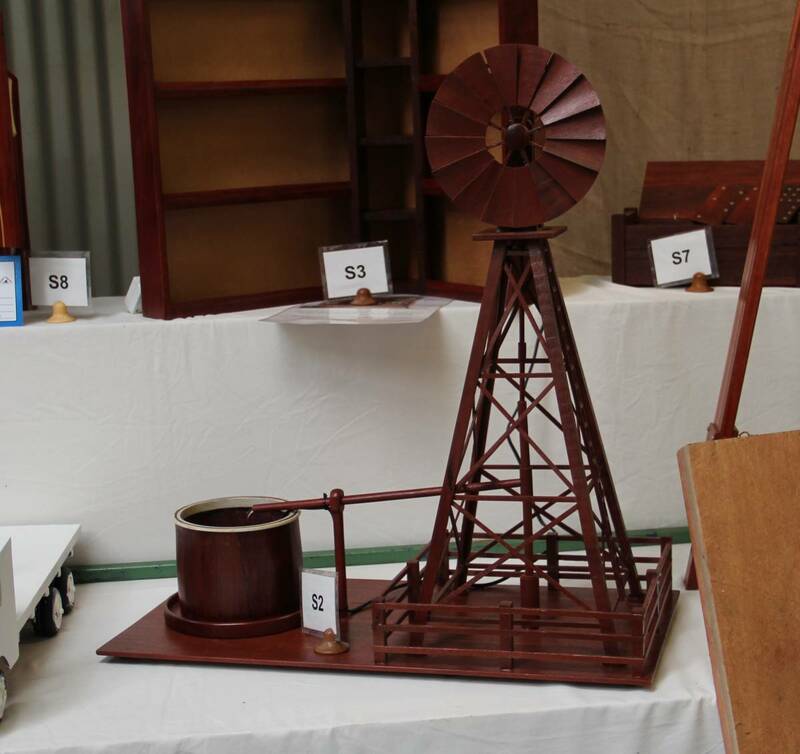 Graeme's windmill (left) breezed in the People's Choice award, pumping water continuously during the show helping the voting along! 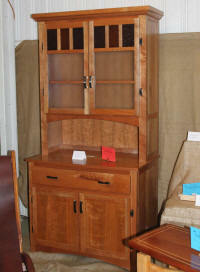 Vern's suspended jewellery cabinet (right)took the main prize. 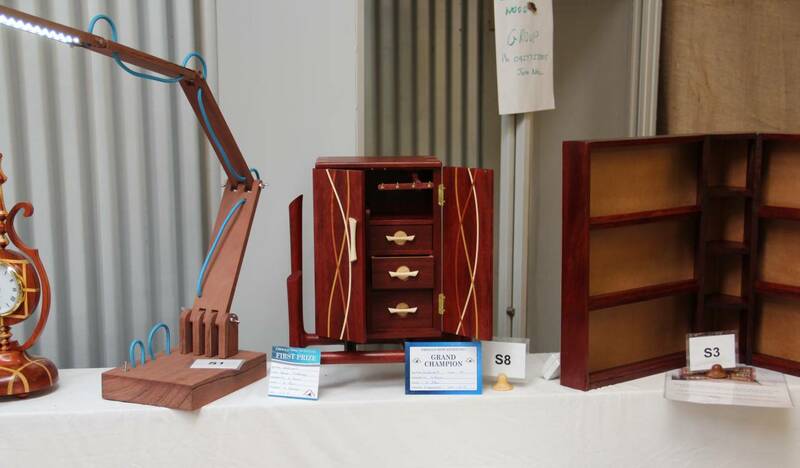 Entries in the general woodworking competition were way down this year, many of the usuals contributors were simply otherwise occupied but hopefully we'll make up for it next year! 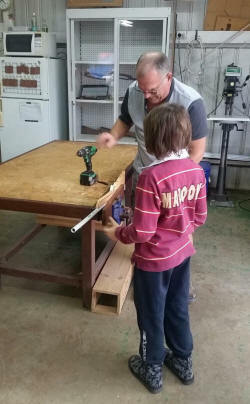 Steve helping a budding young woodie put a toy rifle together. As always, the toy guns were the main event and we sold out completely at the last minute. Work is already underway to make sure we don't run out in 2016. 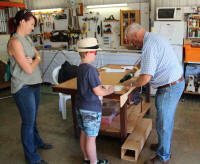 A few quick pointers on how to put a stool together and another young cabinet-maker is born! And that bloke on the lathe was at it again filling the pavilion with camphor-laurel fumes! Things got off to a very slow start this year, the mining downturn has reduced the population a lot and slowed peoples spending but overall the club did OK. Entries in the general woodworking competition were down a bit this year but the juniors had been busy which was good to see. 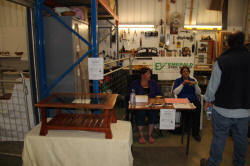 What we lacked in numbers for the furniture competition we made up for in the size of the entries! 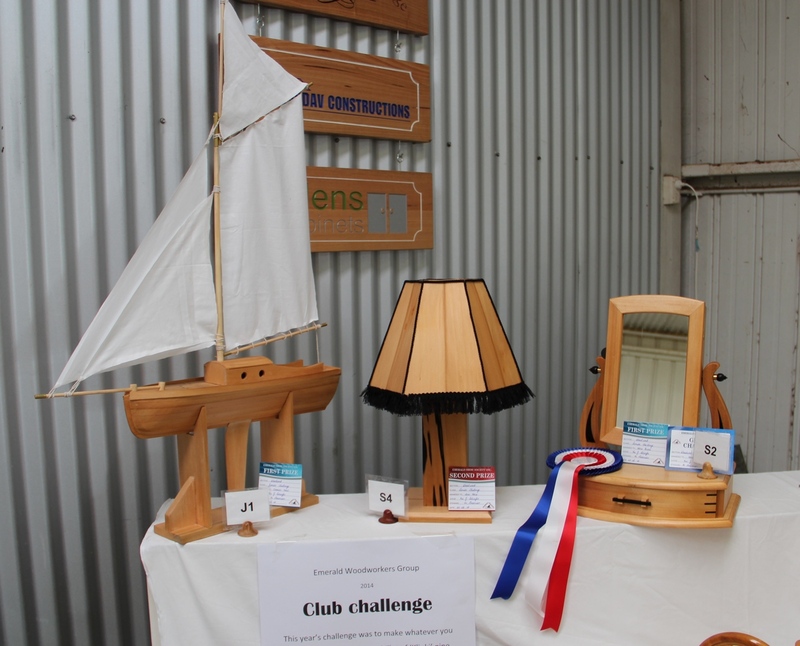 The Club challenge this year was to make whatever you liked from a billet of Klinki Pine (200x100x600mm) - such a soft timber that making anything from it was a challenge! 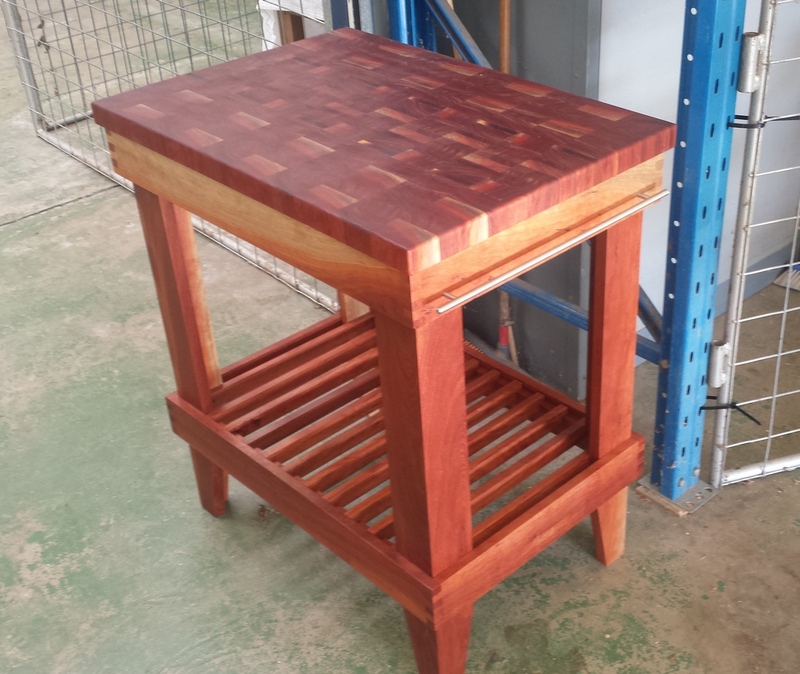 A butchers block made from Bluegum and Dead Finish for the clubs raffle prize proved so popular it topped our raffle ticket sales record! 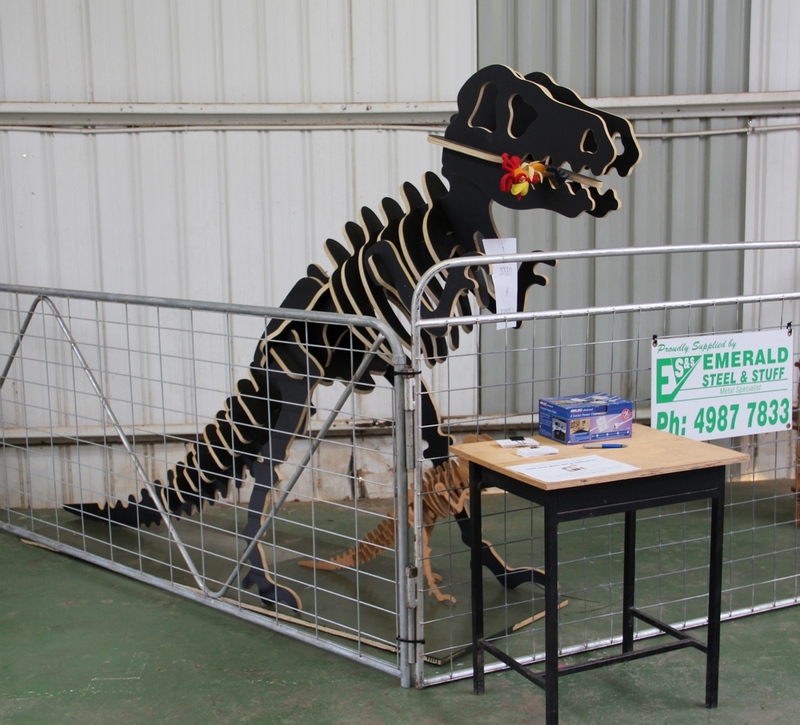 An additional competition for the public this year was to come up with a name for Michael's CNC cut dinosaur, the prize being the little dinosaur beneath him. 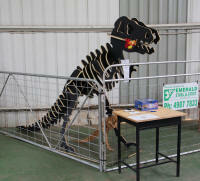 The big fella has since taken up residence at Emeralds science centre. 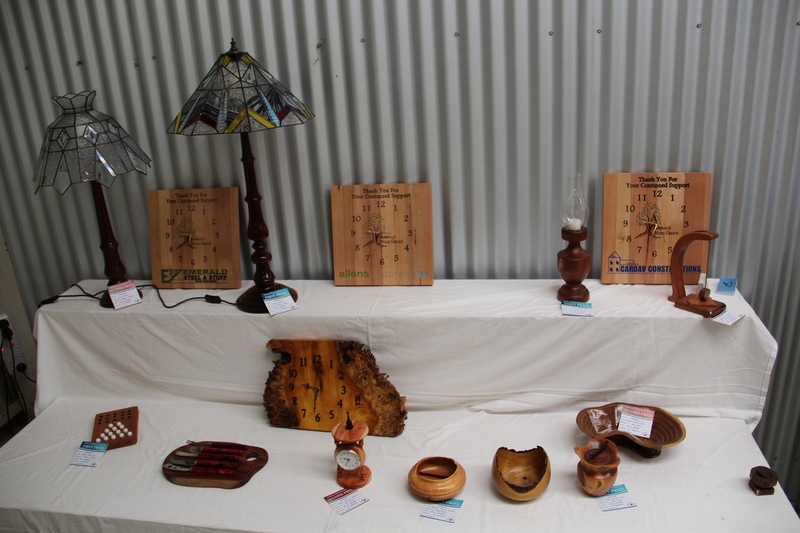 The club was happy to present our major sponsors with some CNC carved clocks this year to show our appreciation. Eddie from Allens Cabinets is pictured receiving his clock from Club secretary Michael Brosnan. The weather was perfect this year and while gate numbers were down, the club still had a pretty good run. The variety of entires was great this year with some welcome surprises in what people are tackling in the district. 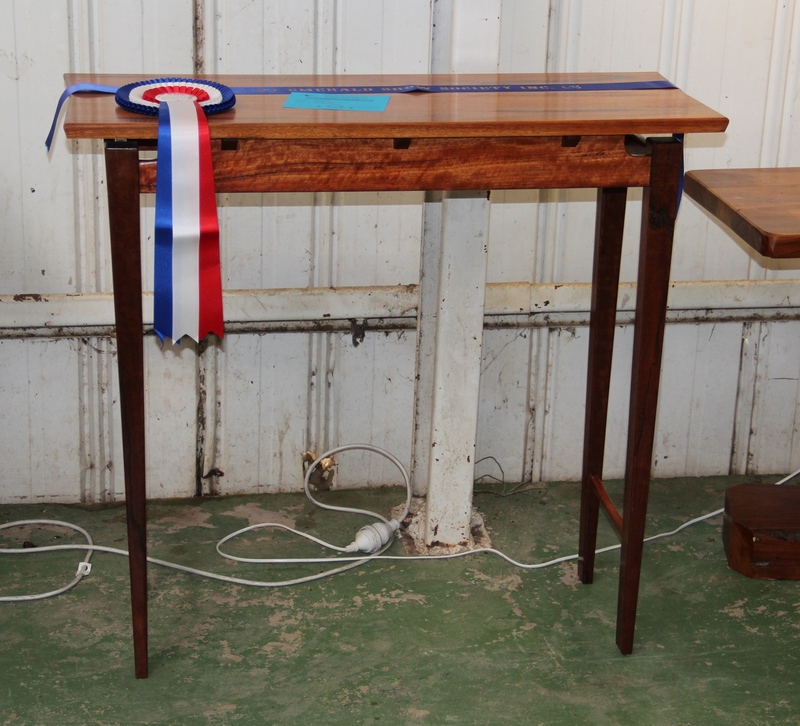 The overall Champion ribbon was taken out by Mark Hatchman this year with his beautifully made hall table . . . . . .
. . . . and Graeme Sypher took out a well deserved 1st prize for his turned Camphor Laurel hat. This years Club Challenge was to make whatever we could from four lengths of kiln-dried 75x35mm hardwood offcuts from a roof truss maker. 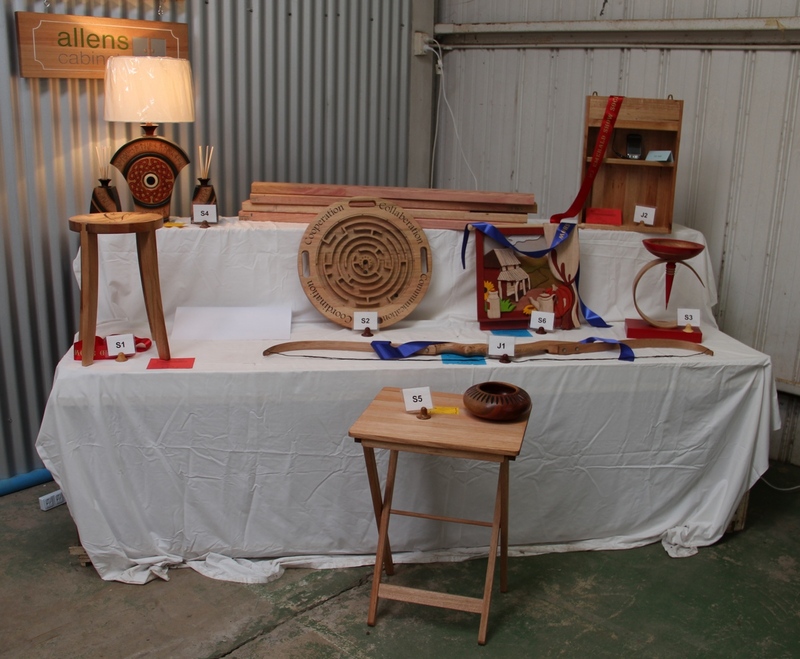 While entries were down a little, the quality was still there with Mel Slade taking 1st prize for his intarsia piece and Charlie New taking 1st in the junior section for his long-bow. 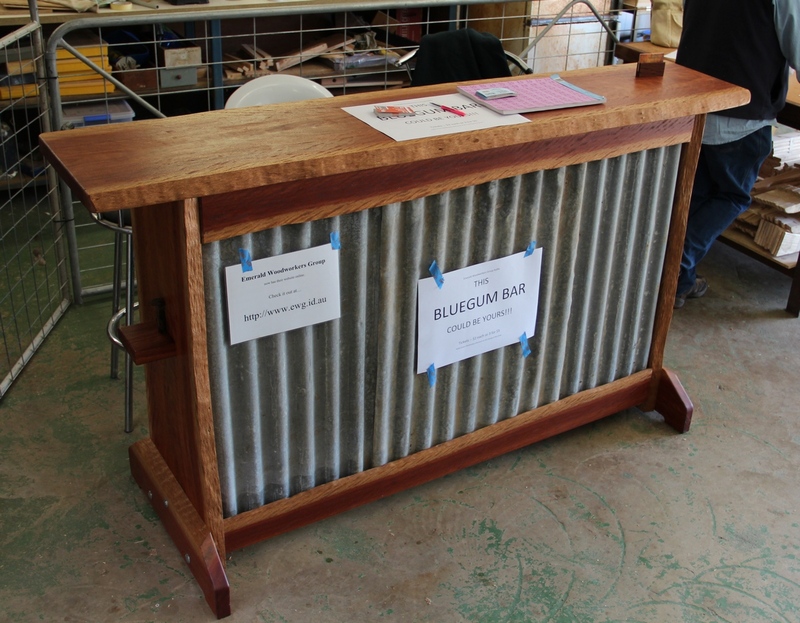 The club raffle prize was a bar made from Blue Gum slabs which attracted a lot of attention . . . . and the winning ticket happened to belong to . . . . . . the club secretary!!!! 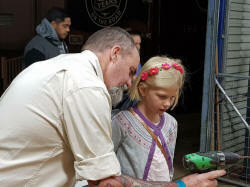 The toy making went well again this year with some kids coming back for their 4th or 5th years - and most still have the toys they made the fist time they came to the stand! 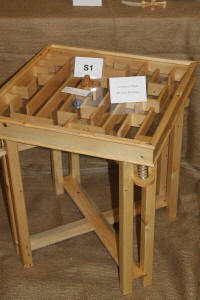 A stool kit put together by Tony as a trial proved very popular so look out for them on the stand next year. 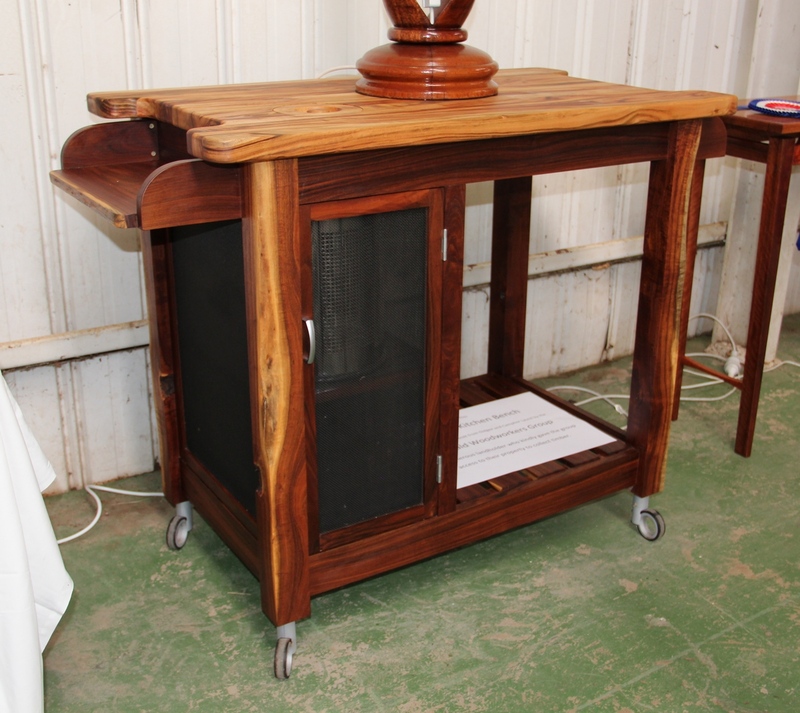 Included in the display this year was a mobile kitchen stand the club made for a property owner who was generous enough to allow us to collect some timber on their land. 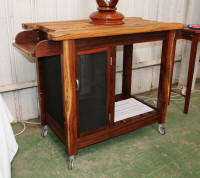 The stand was all made from Gidgee from the property and the top was Camphor Laurel. Things were looking gloomy for this years show until the rain backed off just in time. Gate numbers were good and the club had another great time of it. 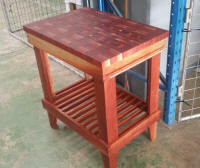 The club was very proud of the solid Blue Gum mobile kitchen bench we made for this years raffle. Tickets sold really well and the bloke who won it also won the second prize of a Lazy Susan!!! Our Club challenge this year was to make whatever we liked from common radiata pine as long as the finished product weighed between 2.5 and 5.0kg. We didn't get a lot of entries but the standard was high and Jon's "air-engine" which is powered by a vacuum cleaner running in reverse was a hit with the crowd. 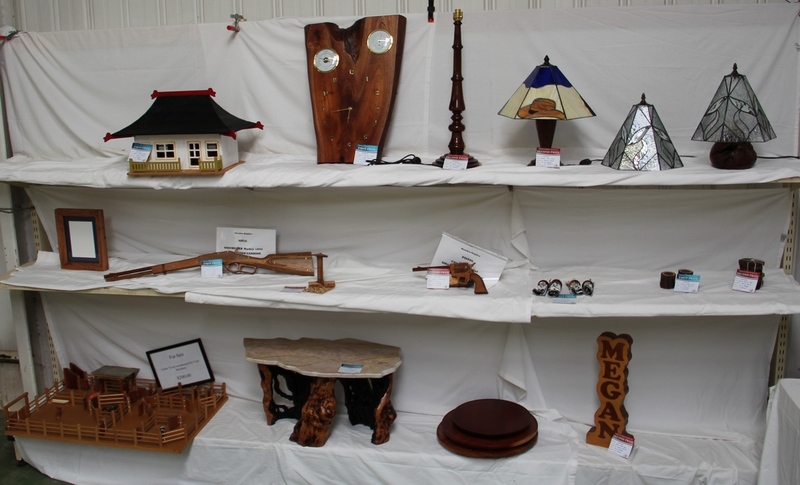 A record number of entries in the woodworking competition gave us our best display yet, particularly in the furniture division where we had to extend the enclosure just to fit them all in! 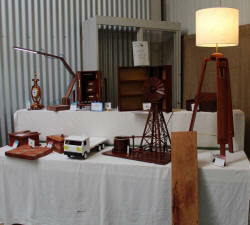 Also on display this year was some of Michael's CNC work and some restoration work from Darryl. Please contact the club if you are interested in either field so that if there is enough interest, a competition division can be created for them. Making toys with the kids got off to a slow start this year but we still just about sold out of kits by the end of the show. People just didn't seem to be spending as much this year. 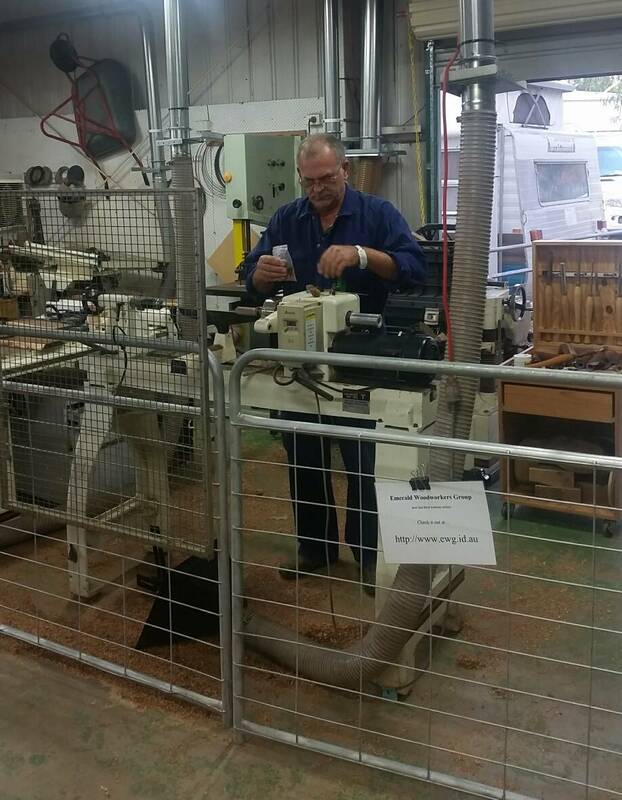 Demonstrations on the lathe went ahead again this year with Neil visiting from Sydney with his thread chasing tools for us to have a play with. Yet another good show for the club. Plenty of people through our pavilion and excellent weather. The Red Bauhinia slab bar the club made for our raffle prize proved a big hit with the crowd and ticket sales went through the roof! 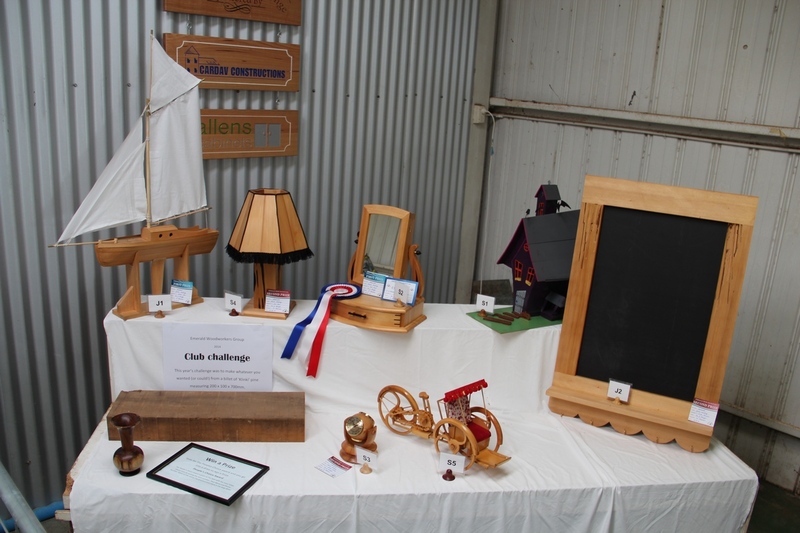 This years Club challenge was to make anything you wanted from three pine boards approximately 16x180x900mm. 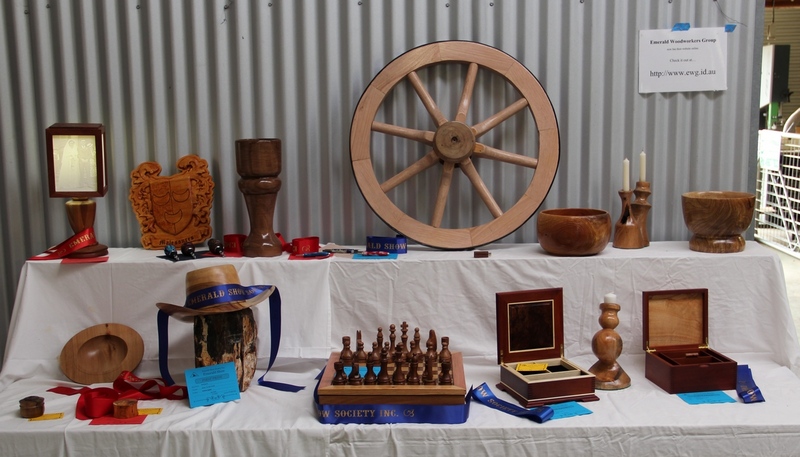 While we didn't overflow with entries, there was a good variety of projects on show with Mel's turned vase winning the senior section and a tote winning the junior section . . . . . and as always, Barry's cattle truck scored the people's choice award. 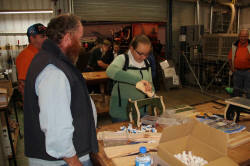 The general woodworking competition entries were down in numbers but still up there in enthusiasm. 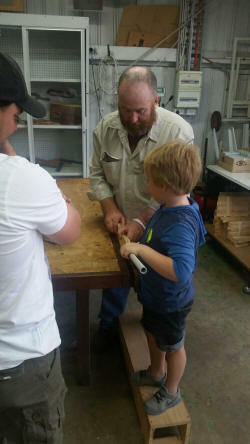 ... and this is our youngest member, Charlie, showing me how it's done! We also had the trophies we had made for the Twin Hills Rodeo on display. ...or maybe it was this smile that sold so many raffle tickets!?!?! Another great show this year saw us spreading out a bit into the next pavilion. Entries were down a bit but good crowds and great weather made up for it. 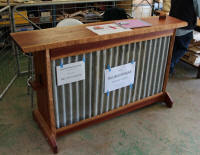 This years challenge theme was 'Recycling' with a common pine pallet as the source of timber. The standard of entries was high even if the numbers were low. A carved Gecko trinket box took out 1st prize. 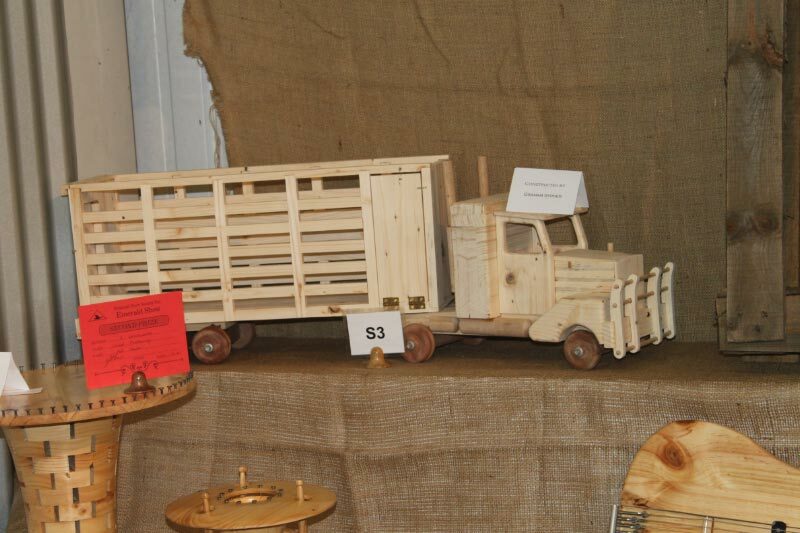 The cattle truck that won the Peoples Choice award. A couple of entries making excellent use of their pallet. 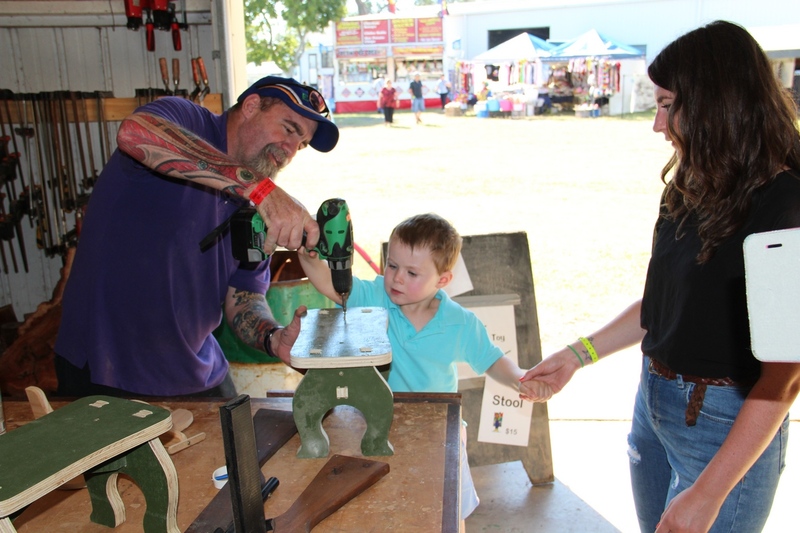 The woodworking section enjoyed a wide range of entry types this year with everything from large furniture items to carving and complex models. This years raffle prize was a set of cattle-yards which proved very popular with the club also scoring orders for a few more from those that didn't trust their luck in the raffle. The toy kits went so quickly this year that by the end of the show we were selling off the display sets! Hmmm! - wasn't that kid in the line-up last year too?!?!? ... and there was that bloke demonstrating on the lathe again! The weather could not have been better this year (for a change) with winter holding off completely until after the show. 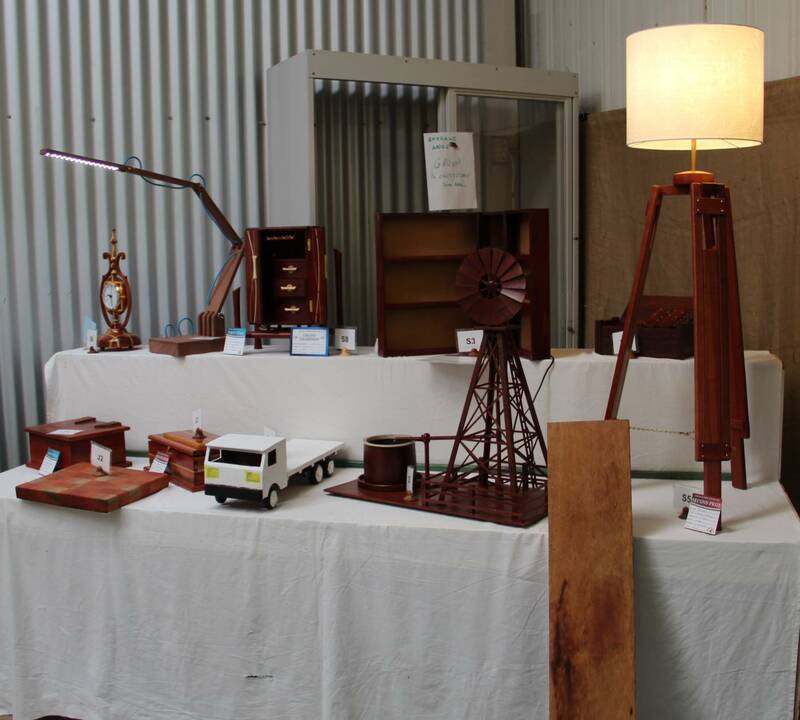 We didn't get time to make anything big to raffle this time but a Gidgee lamp still attracted a lot of punters. Our judge for the competitions was Dave Drescher of SouthEast Queensland Woodworking Supplies and his mobile shop outside the pavillion was an added attraction. 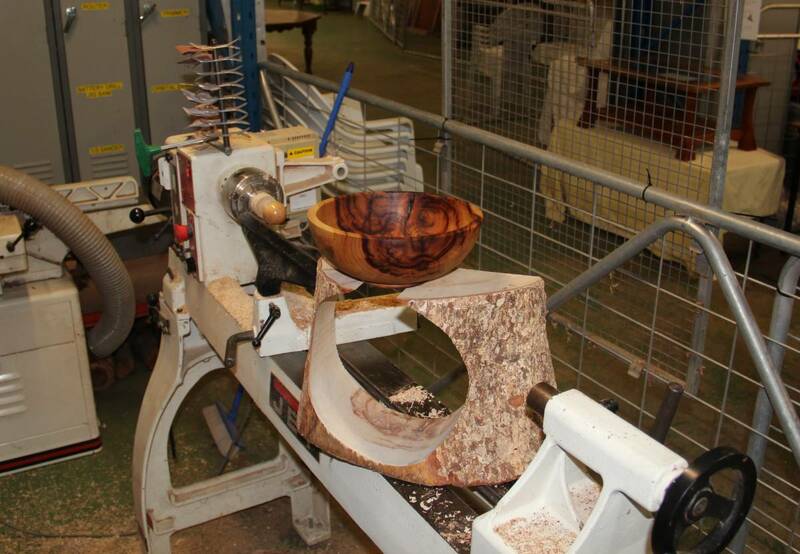 This year we got to demonstrate on our brand new lathe, courtesy of the Gambling Fund grant. The general competition this year was a bit down on entries compared to last year but it's been a busy year for the club which doesn't leave much time for our own projects. 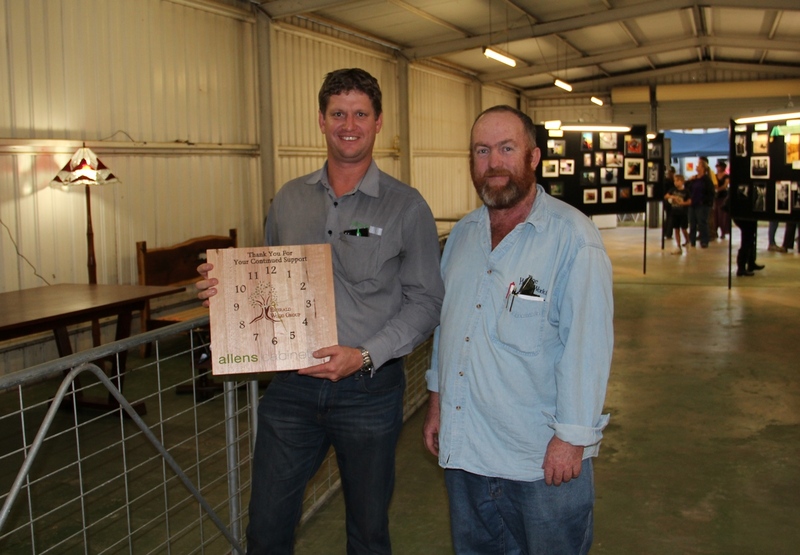 Mel Slade's wooden clock pretty much stole the show and scored him the Champion award. 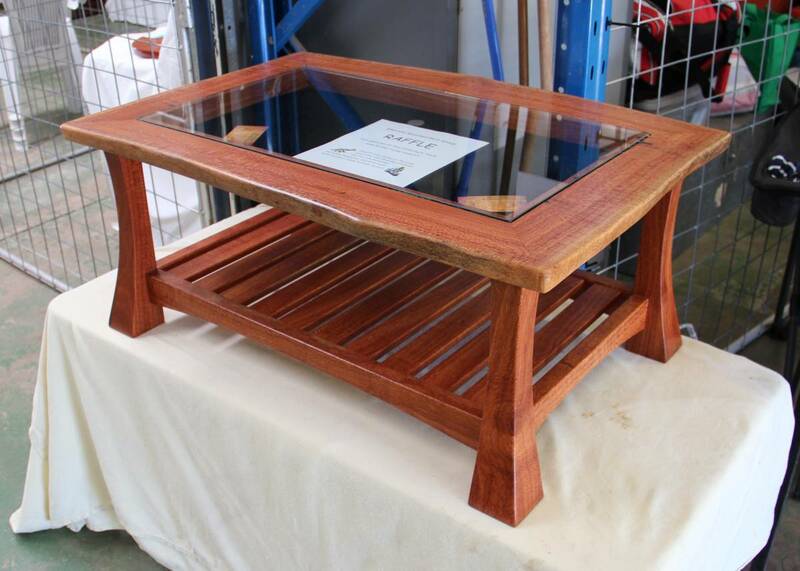 The challenge competition this year was using 2 pieces of Spotted gum, 50 x 150 x 600mm supplied by the club. Entry numbers weren't that good but the standard of entries was high. Winners of the senior challenge from left to right... John New (2nd), Vern Bunn (1st) and Mel Slade (peoples choice). Show steward and EWG member, Kev Pearce, presenting the junior challenge 1st prize. The toy kits went off like frogs in a sock this year. 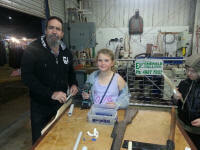 We added rifles and tommy-guns to the range this time and could barely keep up to the demand. The girls were just as keen to swing a hammer as the boys with maybe a future chippie or two among them. Of course the boys couldn't get enough of the guns and the parents all said they would prefer these to the plastic ones in the showbags that cost five times more and wouldn't last until the weekend. All in all a great show for the club and a good time had by all. A club challenge was introduced this year where people could purchase a random pack of NG Red Cedar (well we think it was!!!) and produce whatever they liked to enter into the competition. 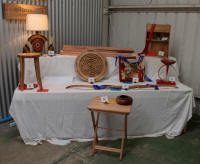 The response was great attracting entries from outside the district as well and some excellent work was produced. ... and the winner is! 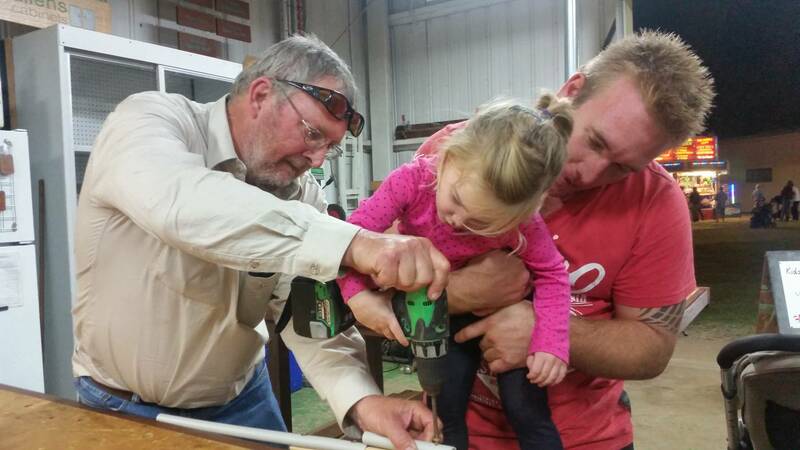 We added toy cars and doll cradles to the DIY kits menu this year and the kids loved them. Lots of future woodies out there if we can spark their interest early enough. The raffle prize this year was a bloodwood outdoor setting which had no trouble attracting ticket sales. 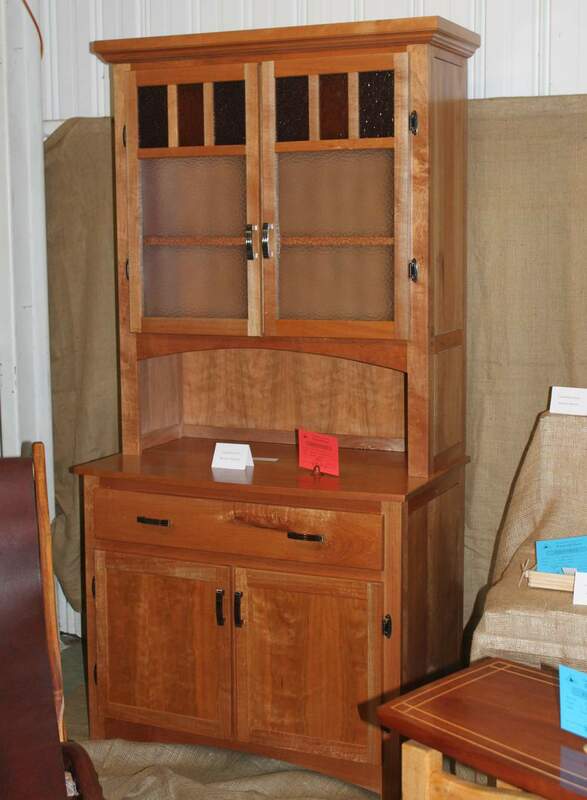 A NSW Rosewood collectors cabinet that won the Open woodworking section. 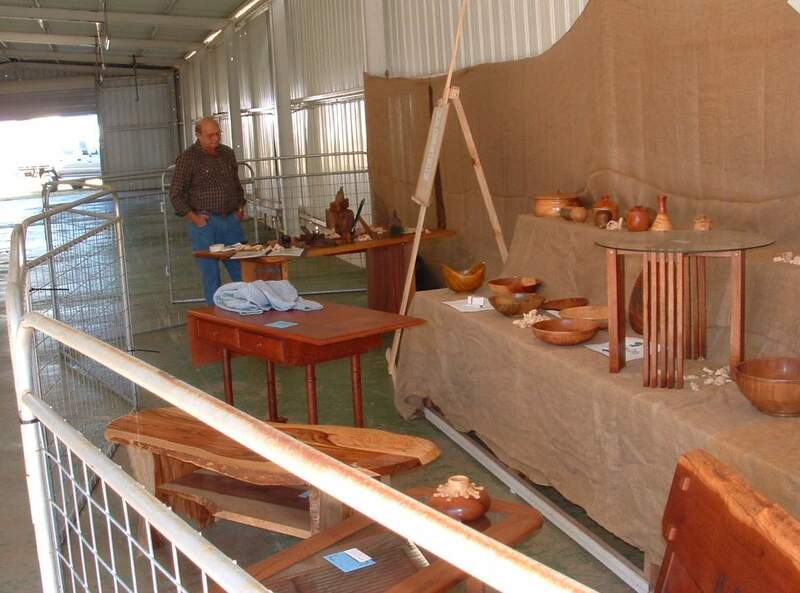 2007 was a bigger undertaking with more going on than just the competition and even though the show was washed out with rain, the event was still quite a success for the club. 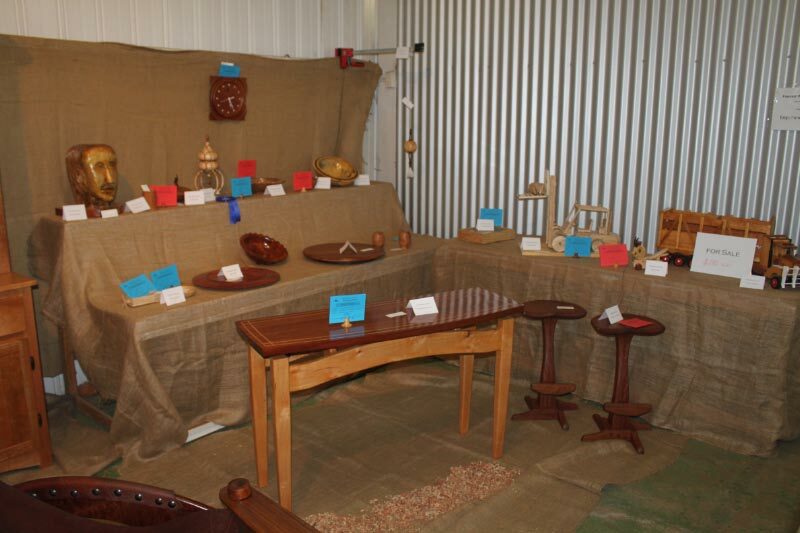 A Bloodwood Squatters chair and a huge blanket box made by the club were raffled off with keen ticket uptake by those who braved the weather. Discussing the finer points of blanket box construction. 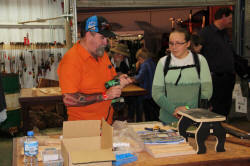 Woodturning demonstrations were running almost constantly throughout the show plus a video display of club activities and other woodie related items looped continually. An idea that proved very popular was some toy aeroplane 'kits' the club cut out and predrilled for the kids to put together themselves. We ran out of the kits very early so will be doing a much bigger batch for next year. 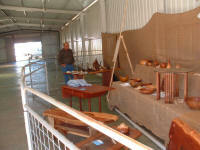 The group took over managing the woodworking competition and display at the annual Emerald show in 2006. Not a bad display for our first shot at it.